No, gentlemen, it’s not magic nor are special effects or is an alien world. 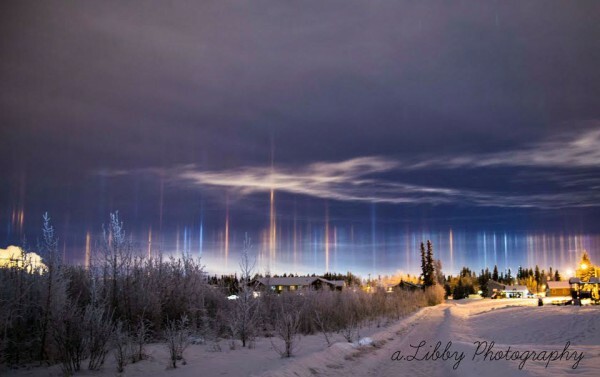 Pictured above are the pillars of light called a photo taken in Alaska having a diffraction phenomenon of the standard physical light. As you know, I hope, the prisms are elements that show the wavelengths of visible light (and non-visible), the wave spectrum. I have seen this with rainbows lifetime when it rains. When you see the rainbow is nothing more than the drops of water that are in heaven doing the same action. Now if these water droplets freeze and ice which precipitates is, what you have is something like the image. That if they have done in the photo trap and have a photo taken for a long time, hence these lines appear. And if ice crystals are considered fog crystals (in form) the effect is magnified. That is, that this picture is but a particular climatic matching and high exposure. Simple physics. But that does not remove its beauty.